No, this isn’t some macabre list of dead people, or people on my hit list. Nor is it a review of coffins. The coffin list is my name for a bucket list. I don’t like buckets – they remind me of work – but I do like coffins 🙂 To celebrate Imbolc, the midpoint between the winter solstice and the spring equinox, I thought I would do some early spring cleaning and explore my coffin list. I always hated having a list of things to do before I die, so I never made a coffin list. But when I had a few health scares in my mid thirties, I took time to look at my life and see if there was anything I really wanted to do. Only one thing came to mind – visit Romania. A diet of vampire mythology from a young age meant I was entranced by Transylvania – the land beyond the forest. I realised I would actually be sad if I never visited. So, for my fortieth birthday, I made the trip to Romania. You can read about this memorable trip in “An Archetypal Homeland” and “In the Footsteps of Jonathan Harker“. Emboldened by having put a nail in the coffin of my first and only coffin list dream, I thought I would add Whitby to the list. Whitby is an English seaside town in Yorkshire and a major inspiration for Bram Stoker when he was writing his novel “Dracula.” I planned to go there for my fiftieth birthday as part two of my Dracula adventure. That birthday has come and gone and sadly I didn’t get to Whitby, but it’s still on my list! Happily I did mange to hammer three very important nails into my coffin list recently. This July my partner and I took a journey to the USA to visit a dear friend on Whidbey Island, celebrate July the 4th in Salem the Witch City and visit puffins in Maine. As a bonus, we also got to meet a baby sloth in Boston. Over the next fews weeks I’ll be sharing this exciting trip with you including recipes inspired from my travels. Make the soup by melting the butter in a large saucepan. Add the onion and cook until softened. Mix in the flour and the chicken stock, stir until combined. Add the cauliflower and salt. Simmer for 15 minutes or until the cauliflower is soft and cooked. Puree the soup then return to the saucepan. Simmer gently until the bread and croutons are cooked. 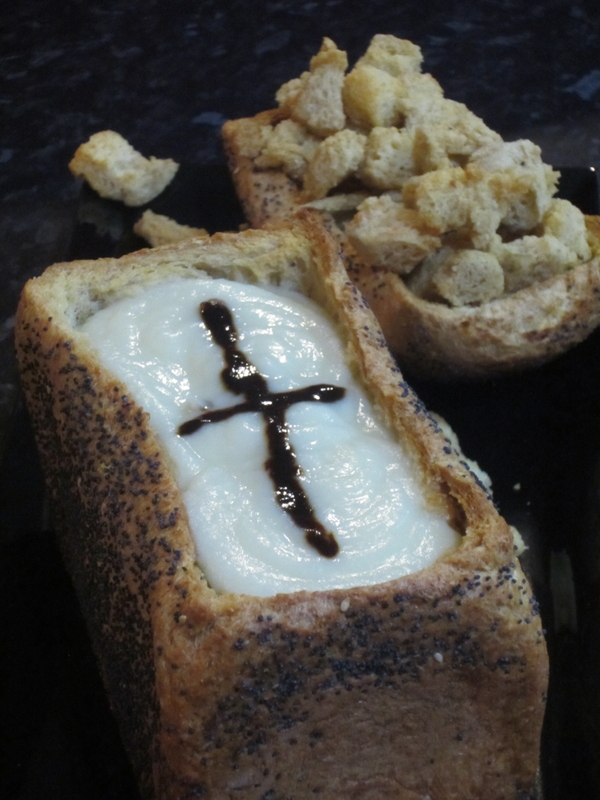 Make the coffin bread while the soup is simmering. Using a sharp knife, carefully cut a lid off the top of the bread. Cut out most of the bread inside, creating a basket to hold the filling. Lightly brush outside and inside the bread and lid with olive oil. Place bread basket on a baking tray. Bake in the oven for 15-20 minutes or until golden on the inside. While bread basket is cooking make the croutons by tearing up the leftover pieces of bread and placing in a bowl with the garlic, olive oil and salt. Toss through and place on an oven tray with the bread lid. Bake in the oven with the bread basket until golden. The lid and croutons may cook quicker than the basket so check and remove when ready. When bread basket is cooked, place on a serving plate. If the soup isn’t ready yet, switch off the oven but leave the bread in the oven to keep warm. Pour the soup into the bread basket. Serve the bread lid and croutons on the side. Whether you are Team Goat, Team Sheep, Team Ram or Team Antelope you must try these delicious Chinese Lion’s Head Meatballs. The meatball is supposed to resemble the head of a lion while the cabbage is its mane. In a bowl, mix together the pork, egg, cornflour, spring onion, salt, soy sauce and wine. Form into 4 large meatballs. Flatten slightly so they are not completely round. Heat peanut oil in a wok or large frying pan over medium-high heat. Brown the meatballs on all sides until golden brown. Drain on paper towels and keep warm. Heat peanut oil in a saucepan large enough to hold the meatballs in one layer over high heat. Fry the spring onion, ginger and garlic until fragrant. Add the chicken stock and sugar and bring to the boil. Carefully place meatballs in a single layer in the stock, cover and simmer for 15 minutes. Place a cabbage leaf on top of each meatball. Cover and simmer for another 15 minutes or until dumplings are cooked through and there is no pinkness in the middle. 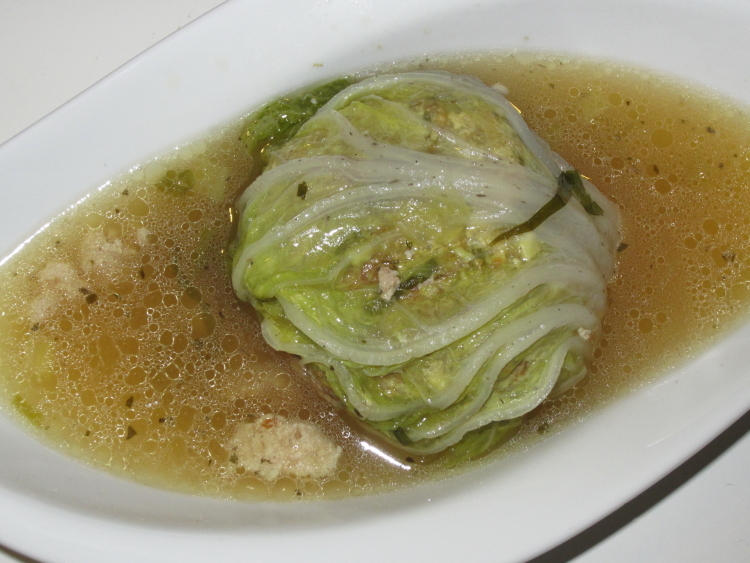 Serve one meatball covered with a cabbage leaf in each bowl. Ladle with stock and drizzle with some sesame oil. * you can substitute Chinese rice wine with pale dry sherry or dry white wine. As the Northern Hemisphere winds its way towards Halloween I cannot help but get caught up in all the excitement. 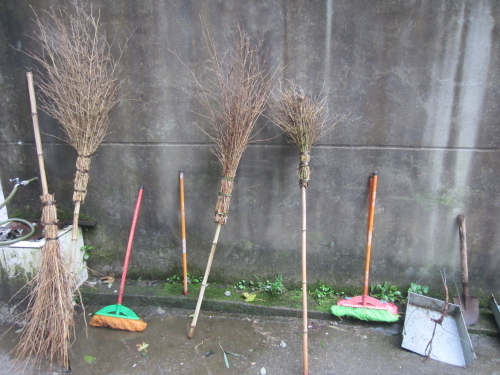 As a Southern Hemisphere Witch I should be getting ready for Beltane, but I can’t. There’s just something about Halloween in October that feels so right for me – especially now that more Australians are celebrating! It’s been about 30 years since I received my coveted Halloween haul and happily things have changed. Now, when I walk into a store in October, I See Dead Things! Halloween decorations delight my eyes and Halloween candies make my mouth water. I know there will be Trick or Treaters coming to my door so I’ve stocked up on chocolate treats including an “emergency” pack of mini Turkish Delight Chocolates in case I run out. They’re really for me, as I don’t think many children actually like Turkish Delight, and I love them. 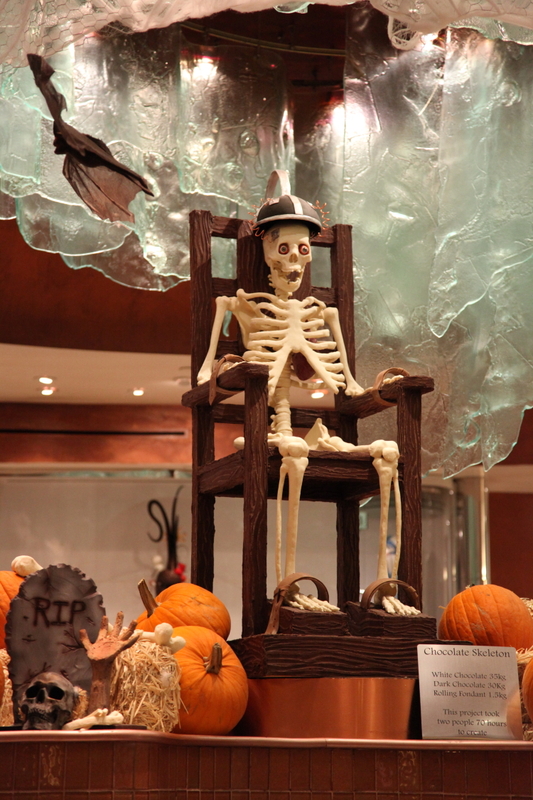 chocolate skeleton in Las Vegas, USA – where they really know how to celebrate Halloween! Some say that the acceptance and participation by Australians in Halloween festivities highlights the commercialisation of the holiday, others argue it symbolises the Americanisation of Australian culture, I just think about bloody time! While, the commercialisation of holidays to sell products is definitely a reason for Halloween gaining popularity, and Australia is also heavily influenced by American culture, it is important to remember that Halloween is not a traditionally American holiday but a Celtic one. Although America has made Halloween what it is today – and I thank them for that 🙂 It is ironic that a country so identified with Christianity has kept one of the most Pagan holidays alive and has spread its popularity throughout the world. 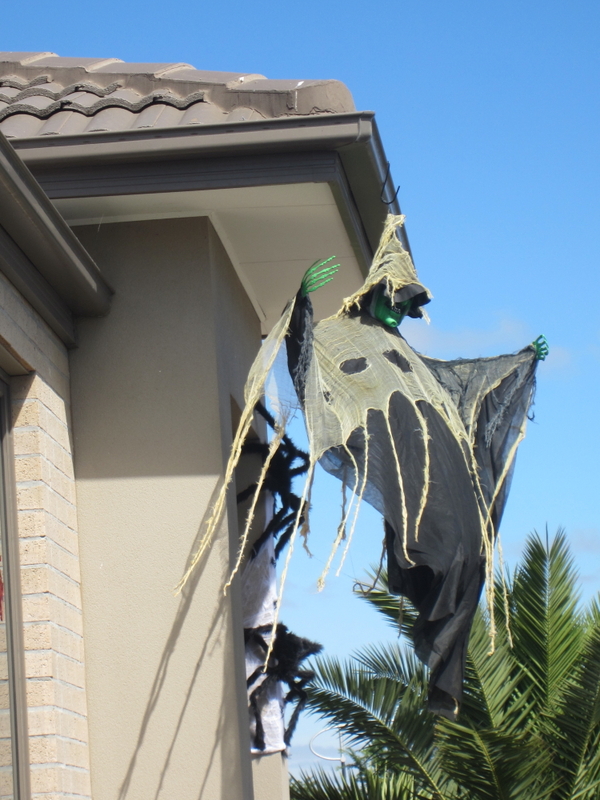 So when I think of Halloween becoming popular in Australia I don’t think of it as rampant commercialism, nor an Americanisation of our culture, but rather as a subtle re-Paganising of the world. 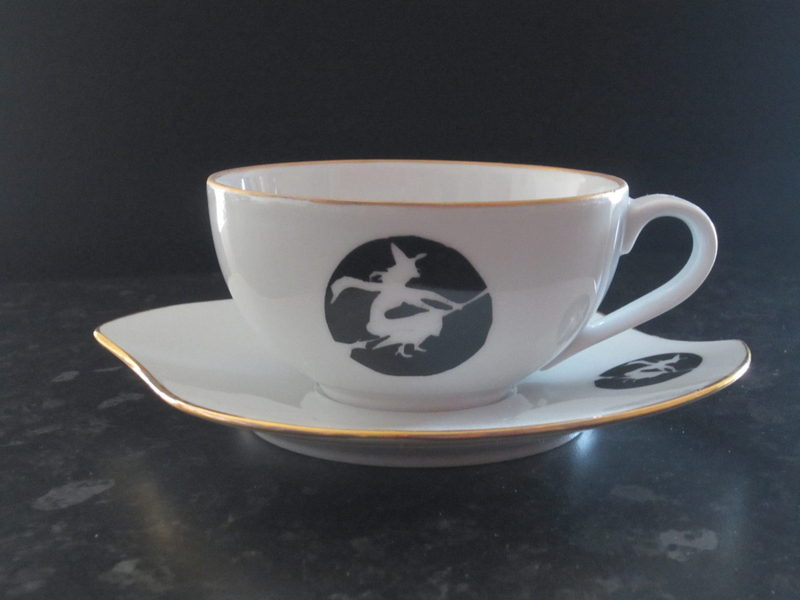 Behind all the costumes and sweets is a memory of what this holiday is all about and who first started it – Pagans and Witches! 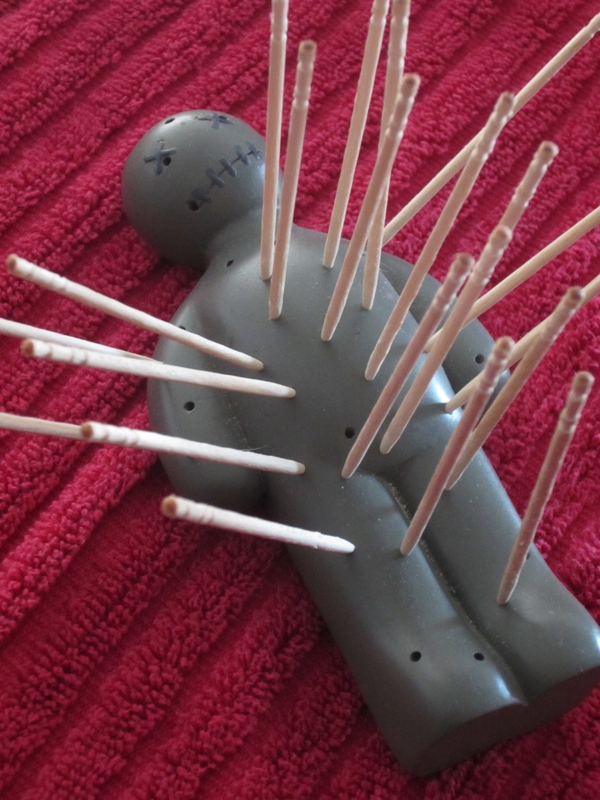 We have been tortured and vilified throughout the centuries and our rituals and holidays appropriated by others. But Halloween is one holiday that has remained stubbornly Pagan. So whatever you are doing this Halloween just remember that from the ashes of the fires we witches are returning, one cackle at a time! A variation on the aptly named Taiwanese street food filled with cauliflower soup, served with pomegranate molasses and garlic croutons. When bread basket is cooked, place on a serving plate. If the soup isn’t ready yet, switch off the oven but leave the bread in the oven to keep warm. Make the soup while the bread is baking by melting the butter in a large saucepan.